Fact 1: What is CRISPR-Cas9 technology? Currently, CRISPR-Cas9 technology, an RNA guided genome editing system is the simplest, cheapest and the most versatile tool for efficient and precise genome editing. This remarkable technology is derived from microbial defense mechanism. Using this technology we can precisely target desired genes at specific locations in a genome by cutting out the unwanted sequence and replace it with our desired gene or DNA segment. Fact 2: Why this name, CRISPR-Cas9 technology? 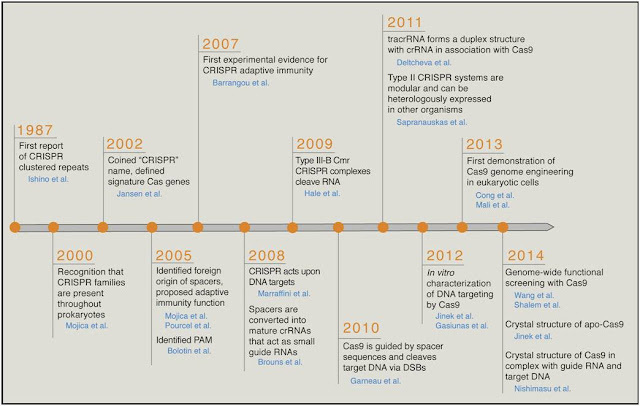 The CRISPR story began in 1987. While studying the iap enzyme involved in isozyme conversion of alkaline phosphatase in E. coli, Nakata and colleagues reported a curious set of 29 nt repeats downstream of the iap gene which is quite different from other repetitive elements in prokaryotes. 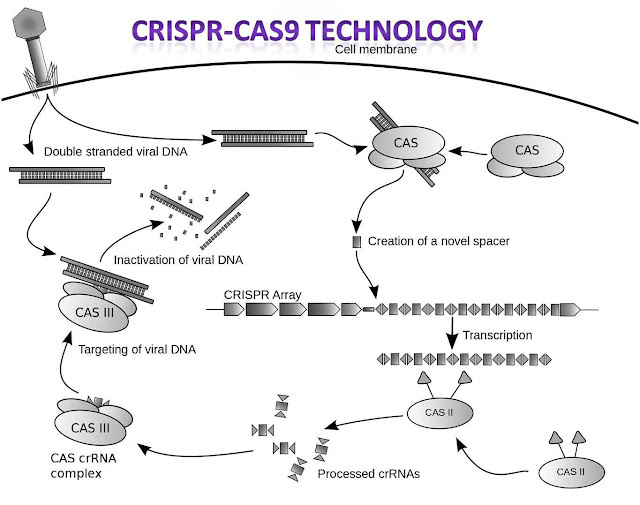 Fact 4: How CRISPR-Cas9 works? Two key molecules are involved in gene manipulation by CRISPR-Cas9. Cas9 is an RNA guided DNA endonuclease that serves as “molecular scissors” cutting double stranded DNA at specific locations. The CRISPR nuclease Cas9 is targeted by a short guide RNA that recognizes the target DNA via Watson-Crick base pairing. 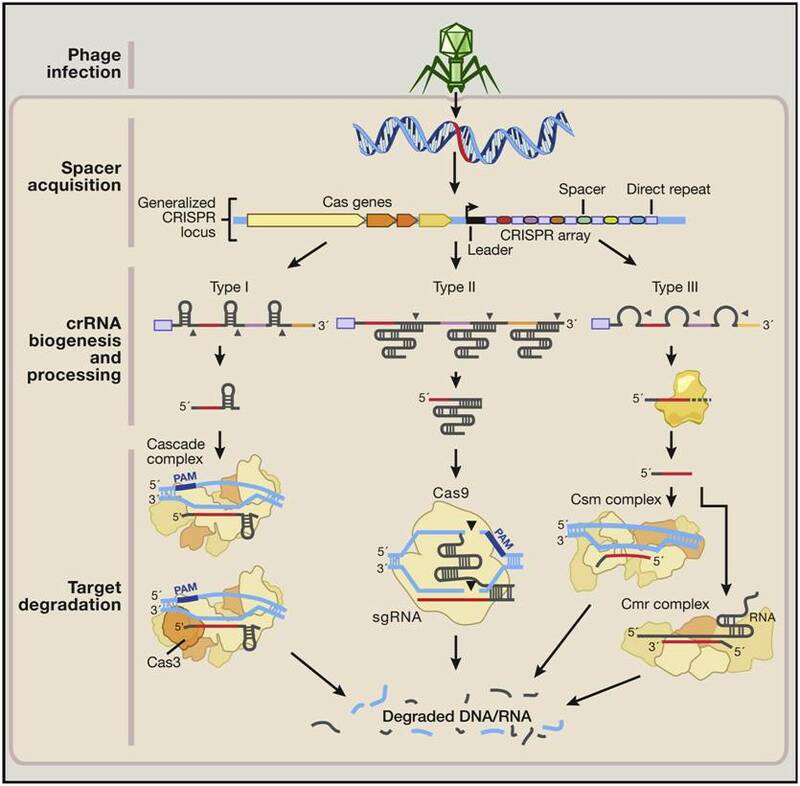 This guide RNA sequence, CRISPR RNAs (crRNAs) is complementary to the phage sequence or plasmid sequence constituting the natural mechanism for CRISPR antiviral defense. Guide RNA will bind to the complementary phage sequence and cas 9 endonuclease degrade phage DNA or RNA thus preventing phage gene insertion. A small portion of phage DNA is retained as spacer DNA to recognize the phage easily when it attacks next time. This guide RNA can be easily replaced by a sequence of interest to retarget the Cas9 nuclease. The point is we can design guide RNAs to precisely target our desired genes to preferred locations within a genome using cas9. Even multiple guide RNAs can also be used to target several genes at once. Fact 5: Applications and future prospects? Genome editing using CRISPR-Cas9 has been successfully carried out in a variety of species including human cell lines. 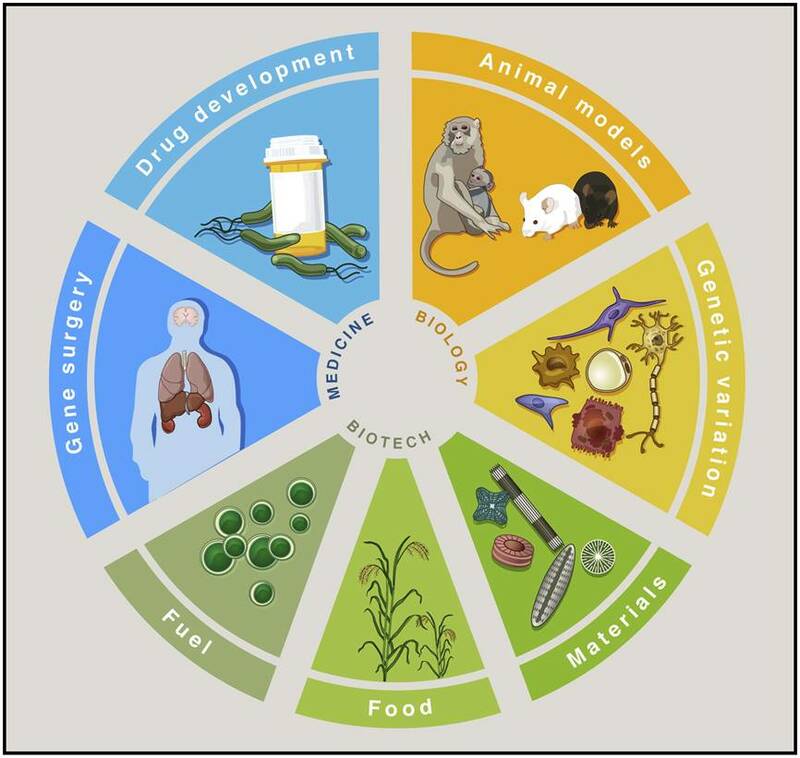 For example, Streptococcus pyogenes Cas9 (SpCas9) has been widely used to achieve efficient genome editing in a variety of species and cell types, including human cell lines, bacteria, zebra fish, yeast, mouse, fruit fly, roundworm, rat, common crops, pig, and monkey. SpCas9 is also dramatically expanding the catalog of genetically tractable model organisms, for example, by enabling the introduction of multiplex mutations in cynomolgus monkeys. CRISPR-based interference, or CRISPRi, works well in prokaryotic genomes but is less effective in eukaryotic cells. CRISPR based transcription repression or gene silencing needs to be further improved. Cas9 as a therapeutic molecule for treating genetic disorders. For a monogenic recessive disorder due to loss-of-function mutations (such as cystic fibrosis, sickle-cell anemia, or Duchenne muscular dystrophy), Cas9 may be used to correct the causative mutation. The multiplexing capabilities (introduction of many mutations simultaneously) of Cas9 offer a promising approach for studying common human diseases such as diabetes, heart disease, schizophrenia, and autism—that are typically polygenic. Use of CRISPR-Cas9 technology for editing germ line cells is highly controversial. It is illegal and prohibited by law in most countries due to ethical reasons as germ line editing will be passed on from generation to generation. Anyway, gene editing in somatic cells is uncontroversial. Sander, J. D., & Joung, J. K. (2014). 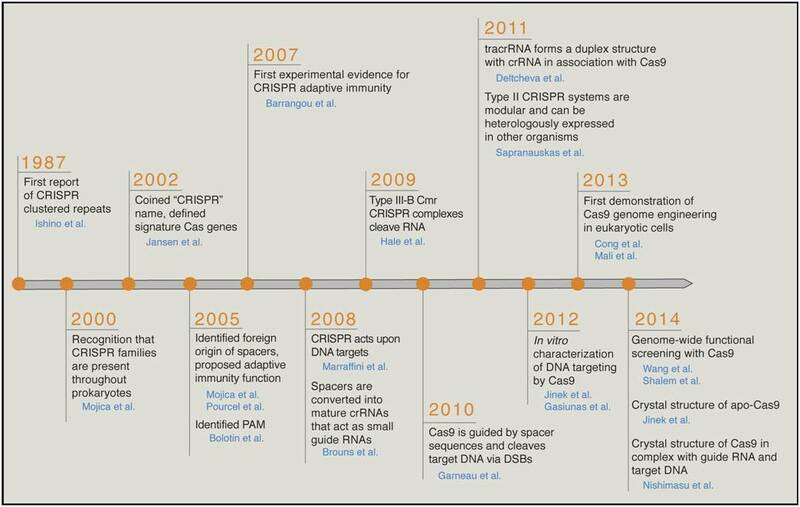 CRISPR-Cas systems for editing, regulating and targeting genomes. Nature biotechnology, 32(4), 347-355.